Hilton Head Shore Notes is more than just an a cappella ensemble, it is a family. We love getting together each week, and sharing friendships as well as great music. If you like to sing, you're invited to visit Hilton Head Shore Notes and discover your INNER DIVA! Sitting in on one of our rehearsals is the perfect way to find out more about us, and what we can do for you! You'll have the opportunity to hear us perform four-part, a cappella harmony, and you'll be invited to join us on the risers to experience the music, friendship and fun for which Hilton Head Shore Notes is known! Guests are welcome to view any Hilton Head Shore Notes rehearsal, Monday evenings, beginning at 7pm. In addition to weekly rehearsals throughout the year, we perform an annual show each year. 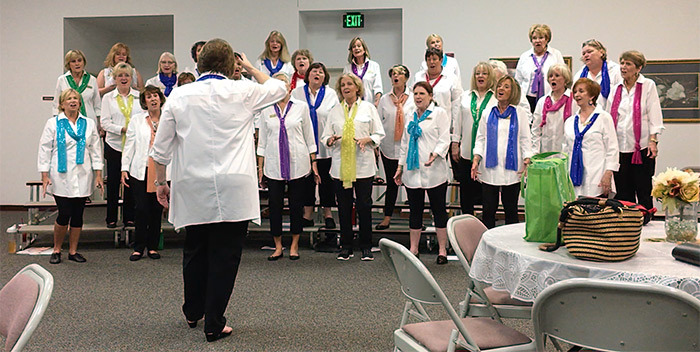 We also participate in a Sweet Adelines regional competition in April each year, and have an annual weekend retreat to focus on preparing for competition. We tend to perform in and around our area about 12-14 times per year for local festivals, business events, charitable events, Christmas, and arts festival events. Dues are a set fee each month (currently they are $40), and include all chapter, regional, and international dues. When you are ready to audition, a practice piece of music will be provided. Once you have learned the music, you can request an audition. The Director and Section Leaders will listen and sing with you. Our goal in Sweet Adelines is to teach and enjoy music. Although you don't have to "read" music, it is a big help in learning the songs. All you really need is a love of music and the ability to sing your part while someone next to you is singing a different part. It may be disconcerting at first, but most women catch on quite quickly and really enjoy singing 4-part harmony with their chorus neighbors. And we do use learning tracks to assist you in learning your part. As you learn and put to use vocal techniques, your singing will become better and your level of enjoyment will increase. We usually introduce new songs by providing members with a learning track and the sheet music, both of which can be downloaded from our website. There are some good tips on how to learn a piece of music once you have it in hand. Those tips will be posted in the notes section of the website. You typically have three-four weeks to learn a piece of music well enough to sing along at rehearsals. A few more practices with the chorus and you are requested to set aside the music and sing from memory. All of our music is sung from memory and at each rehearsal we practice the music until we are satisfied that it sounds good enough to be included in our performances.